We had a wonderful Thanksgiving weekend spent at home. My sweet hubby had about 25 relatives that we spent Thanksgiving Day with and boy did we have fun! We weren't able to take very many pictures due to a "technical problem". We were pleasantly surprised to get a Christmas Card picture. I actually ordered the cards today. After a long search I finally decided to use the picture as the whole card front. The inside has individual pictures of Clark, BellaRuth and Will Henry on the beach in Sanibel this summer. Of course I included a sweet Holiday greeting too. I thought I would share some of the photos that didn't make the card.... and the one that did!!! Will Henry was trying to escape! And BellaRuth has the funniest look on her face. I think that this is a sweet picture. BellaRuth is trying to get Will Henry to look at his Daddy. Poor Clark just wanted it to be over. This is our Christmas Card picture for 2008. I really think that it captures each one of my children. I can't wait to see yours...please share!! Your card will be gorgeous! 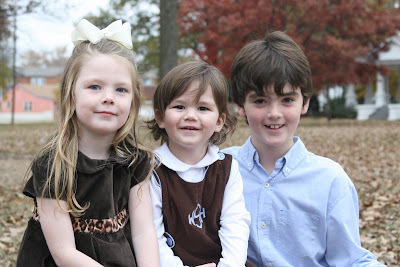 Darling pictures of your GORGEOUS children! They look very English?? Oh this is a GREAT photo. I don't even know your beautiful children but it seems show personality! Well they couldn't be any cuter - all of the pictures are adorable - I especially love the one you chose for your card. Hope you are enjoying the holiday season! It's beautiful! I wish I could get something so cute...at this pace I'm not sure I'll get them out.